Prevents polluted water from entering the potable water supply system by preventing the reverse flow of water into supply lines. Cast bronze body and brass union inlet connection. The Cash Acme BF-1 is available in 3/4 and 1 sizes and incorporates a female threaded union inlet and a female threaded outlet. The Cash Acme BF-5 is available as a 1 meter threaded (swivel) inlet and 3/4 FNPT (union). 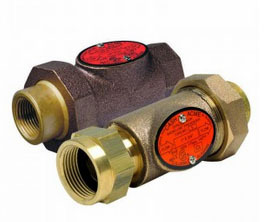 For continuous or intermittent applications on water supply lines.